In your company, do opposites attract, attack…or avoid each other? There are numerous examples of successful partnerships built on shared passions and skills. Bill Gates and Paul Allen were both enamored with computers and had a shared entrepreneurial spirit. Ben Cohen and Jerry Greenfield were high school friends who both loved food and especially ice cream! But many other wildly successful partnerships included diversity in behaviors, skills, passions, and perspectives which were the KEYS to their success. The partners had learned to leverage their gaps. Steve Wozniak created an original computer model but never thought about selling it or changing the world, until Steve Jobs suggested it. Undoubtedly, the team you work with each day has gaps. But, do you know what they are? Is your team leveraging its gaps to win together? Or, are the gaps creating conflict and failure to perform? Do some of your team members who are more laid back and easygoing regularly clash with those who are task-focused and fast-paced? Our Flippen Profile™ Urgency and Intensity scale uncovers the motivations behind the behaviors and their impact. You likely have people on your team who are collaborative, team-oriented, and encouraging, but who find themselves at odds with others who display varying degrees of autonomy and independence and who rarely, if ever, say an encouraging word. The Flippen Profile Need to Nurture scale provides specific behavioral insights into these common team gaps and how to fill them. And how productive are your meetings? Do the assertive, take-charge types run over the agreeable, cooperative members? Are the forceful, “I have to win” people escalating arguments that the more conciliatory folks are trying to avoid? Our Deference and Aggressiveness scales accurately identify each individual’s score on the continuum, providing awareness about the members’ impacts on others and the bottom line. What are you doing about the gaps on your team? Abraham Lincoln is credited with saying: “I don’t like that man. I must get to know him better.” President Lincoln understood and embraced the wisdom of pulling closer to those who are different or opposite from us. 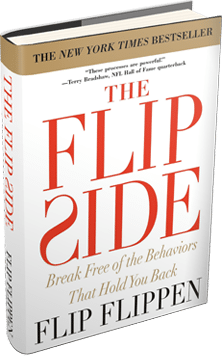 The Flippen Profile can help you and your team identify where your “opposites” are hindering team performance rather than leveraging their gaps. We can scientifically measure behaviors, identify the gaps, and utilize our proven coaching process to turn those gaps into strengths. Let’s fill in your gaps! Contact us.